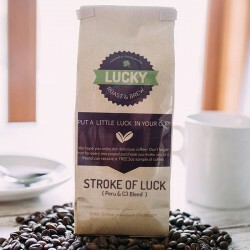 Put a little luck in your cup! Lucky Roast and Brew that is! We have a special gift for that coffee lover in your life. Our mission at Lucky Roast & Brew is to share the experience of great coffee with you, our friends and family. 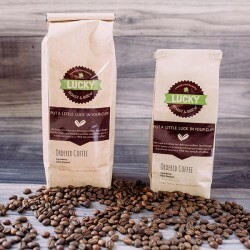 We want everyone to taste the deliciousness that is Lucky coffee so with each 1 pound of Lucky Roast Coffee you purchase, you will receive a free 2oz sample of your choice. We hope you will share it with a friend, family member, neighbor, or any other coffee lover in your life and help us spread the coffee love. Let us show you why you're so LUCKY that you've chosen us. Save time by not placing the same order each month and sign up for the Lucky Coffee Club. On top of our great selection of international coffee roasts, Lucky Roast & Brew also offers two specialty roasts. These specialty roasts blended just right and with a little luck to create a flavor that will have your taste buds asking for another cup. NEW BLEND! A mix between Peru, the smoothest coffee, and C3, a bean that contains three times..